I just wanted to say how excited I am about this fabric! I found this at Sew Flakes in Broken Arrow and just love it. 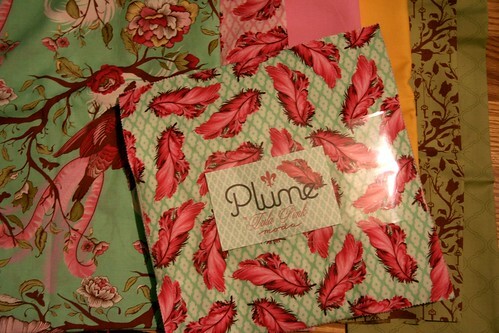 My grandma is making a quilt for my soon-to-arrive baby girl out of the Plume line. It will be a bright, girly quilt and I can't wait to see it finished. Check out the Tula Pink blog and twitter! I'm so lucky to have awesome quilters and seamstresses in my family - they are making pretty much everything fabric related that will be in the nursery including: curtains, a crib blanket, slips covers for my glider and pillows - all by my mom and several handmade quilts from my aunt! I can't wait!! It's going to be an awesome room! My Prairie Letters poster came in the mail today!! Check out The Wheatfield on etsy or Katie Daisy on flickr for more posters. Thanks for the find, Ashley! Thank you for posting our website on your blog! How did your quilt turn out? I'm now not positive where you are getting your information, but good topic. I must spend some time finding out much more or understanding more. Thank you for wonderful information I was on the lookout for this information for my mission. I was just wondering if you still had your Plume layer cake and would be willing to sell it?